Home was owned by the City of Kent. An abandoned house owned by the City of Kent burned down today in the 22300 block of Russell Road, along the Green River. The fire in the two-story home was reported at 5:20 AM, and the smoke column could be seen for miles in the still morning air. 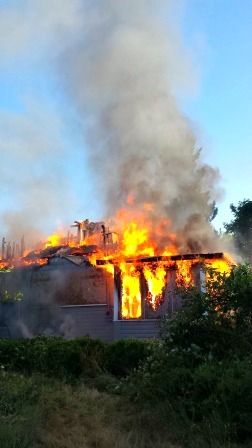 When firefighters from the Puget Sound RFA and South King Fire and Rescue arrived, they found the entire second floor of the house engulfed in flames. 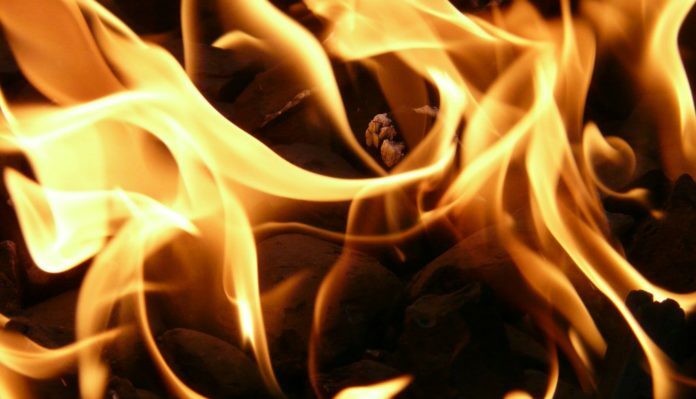 The incident commander determined that the house, which had a chain link fence around it, was too far gone to risk sending firefighters inside and set up hose lines around the house to extinguish the fire and keep it from igniting a barn just to the south. Because the home had been boarded up, firefighters had difficulty getting water onto the center of the fire on the second floor. The incident commander allowed the fire to burn through the roof to create a hole which could be used to get water inside. Because of the amount of fire damage, the fire investigator stated that it is unlikely that a cause can be determined. 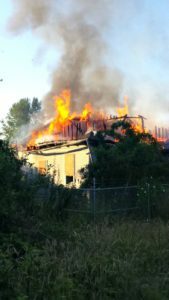 According to several people, people have been seen climbing over the fence surrounding the property and a fire crew reported that a sliding glass door appeared to have been forced open prior to their arrival.